Two UCHealth hospitals have moved past the ink-and-paper method and are capturing newborn footprints into an electronic record. A baby’s first footprint, taken at the hospital just moments after birth, is a keepsake many parents treasure. But now their value goes far beyond the baby book. Theodore Campbell McDonald protests his footprint being taken at UCHealth Poudre Valley Hospital. PVH and UCHealth Medical Center of the Rockies are using an electronic scanning system for newborn footprints. The scanning doesnt hurt the baby. The digital files are stored in a database for the lifetime of the child. 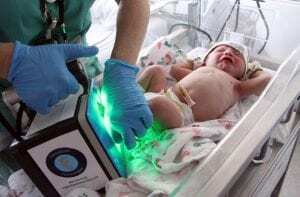 UCHealth teamed up with CertaScan Technologies to have two of its hospitals be the first in Colorado to electronically scan a baby’s footprints, providing an electronic identification record that can be used for a lifetime. “Footprints have a ridge pattern that stays the same through a person’s life. The space between those ridges changes, but the uniqueness in the pattern does not,” said David Yarnell, CEO of CertaScan Technologies. Minutes after birth, scans are taken of both the mom’s index fingers and the newborn’s footprints. Jane Campbell said she watched across the room as her newborn son, Theodore, born at 9:52 a.m. Oct. 14, was quickly scanned. “For me, being across the room and having those little footprints pop up on the screen was so cool,” she said. Campbell delivered at UCHealth Poudre Valley Hospital in Fort Collins. UCHealth Medical Center of the Rockies is also using the new technology. Campbell was delighted to know she could access those footprints via the CertaScan website. She can print and edit her first keepsake for Theodore’s baby book. She was also thrilled to learn that they’d be on record for life. With this new live-scan technology — the same used for fingerprinting — we are able to take newborn footprints and store them in a database that can later be used to help identify the baby in emergency situations, said Laura Hall, clinical director for Women’s and Pediatric care for UCHealth in northern Colorado. The mothers fingerprints are taken and recorded with the newborn footprints for better identification records. Easier to capture than a newborn’s clenched handprint, newborn footprints began to be recorded around 1960, according to a New York Times article. The newborn footprints, along with a mother’s fingerprints, became part of the hospital’s records as a requirement by states to help prevent mix-ups in hospital nurseries. The National Center for Missing and Exploited Children still recommends that hospitals capture a baby’s footprints. According to 2016 survey done by the center, about 90 percent of hospital still do so, but through traditional ink-and-paper or inkless paper method. While not a common crime, according to NCMEC, the abduction of an infant from a health care facility is still a subject of concern. To help prevent a newborn leaving the hospital with anyone other than the parents, hospitals have systems in place, including wristband alarm systems. The electronically scanned footprint is an added security measure that has a lifelong benefit, Yarnell said. 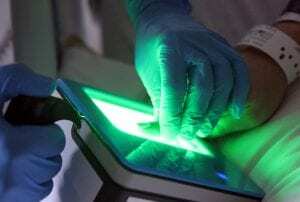 A nurse scans the newborns identification bracelet prior to scanning his feet so that records are filed together. By working with the NCMEC, CertaScan has created a national database of all the newborns scanned by their system. CertaScan is currently the only company providing this service to hospital birthing centers. “If ever a baby is found, law enforcement knows to call the NCMEC. Then they will contact us to look into the database,” Yarnell said. PVH and MCR are two of the 72 U.S. hospitals using the new technology. As of September 2018, about 160,000 babies’ identifications were filed in the database, he said. And about 10,000 being added each month.